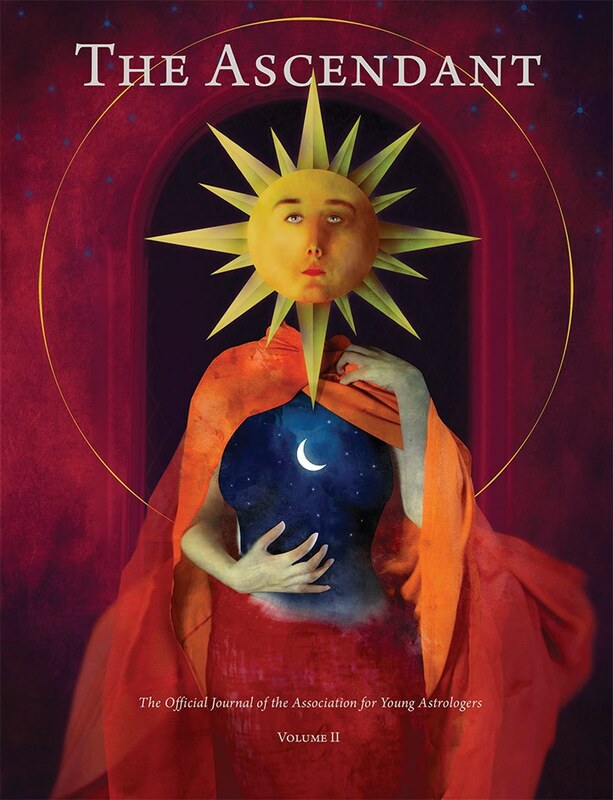 The Ascendant is the official journal of the Association for Young Astrologers. You can purchase a copy of this journal by visiting the Revelore Press website. Read the letter from the editors below to learn more about the works contained in this volume. Welcome to the second volume of The Ascendant, the literary outlet for the Association for Young Astrologers. Upholding our mission of intergenerational continuity and helping emerging astrologers enter and excel in the field, we present an ad-free blend of technical, theoretical, and historical articles with astral-inspired images by authors and artists of all ages. Our timing for this volume, and perhaps the journal as a whole, carries a significant astrological signature. As we set about creating a new Ascendant in time for the 2018 United Astrology Conference, in Chicago, Mars conjoined Saturn in Capricorn in the ambient, which echoed the Mars/Saturn conjunction in Scorpio in 2014 that occurred when we worked on the first issue. The process has been quite intense. As of this volume, we welcome Wade Caves, as charts editor, and Danny Larkin, the current aya president, to our editorial board. We would also like to acknowledge the pivotal labors of our outgoing president, Alia Wesala, in bringing The Ascendant back into print and securing a relationship with Revelore Press to bring out issues on an annual basis. We are grateful to Alia, our authors and artists, and everyone who worked with us to make this issue possible. We open with a contribution by Michael MacLafferty on the question of disability in astrology. We then move to an extended examination of the astrology behind the return of Wonder Woman, by none other than Wonder Bright, which weaves together the history and astrology of Wonder Woman’s creation and reëmergence. From there, we encounter artist Grant Hanna’s wandering pilgrims—a rich depiction of essential dignity per planet. The next three pieces sharpen our technical toolkit: First we have Lars Panaro giving a concise consideration of the seven Hermetic Lots; we move on to learning how to use the prenatal syzygy and the Daimon to predict violent death according to Vettius Valens with Tania Daniels; and then Cassandra Tyndall takes us through the life of Madonna to demonstrate the technique of Firdaria. Then we discover Gary P. Caton’s new findings on the long cycle of Mars and Venus, a long-awaited companion to his contribution to volume one. Switching gears to a different long view, Estebon S. R. Duarte presents a scholarly piece on the history of astrological transmission from Mesopotamia to Greece. From Greece we hop over to India, where Freedom Cole reveals a more nuanced understanding of the practice of astrology on the subcontinent. In our first issue, J. Lee Lehman scrutinized the potential astrological markers of humanity’s perilous relationship to the split atom. David Leskowitz brings attention to nuclear power again, through his exploration of how the trans-Neptunian object Berossus fits into the historical events and astrology. Pivoting ever so slightly, Kenneth D. Miller takes us through the incredible history of how Pluto got its significations. Finally, we close the issue with a juxtaposition of new and old. Kent Bye returns to share his visions for astrology’s future in 2025, and this is immediately followed by the first-ever English translation of a lecture given by philosopher Count Hermann Keyserling in Germany in 1910 about astrology and the human imagination. We end on this archival note firstly with the express wish to see more of you translating texts from relatively modern materials (not just Latin, Greek, and Arabic sources), but also to show how far we may or may not have come in the 108 years since that lecture was first delivered. After all, 108 marks the degrees of arc distance from the Sun when Saturn makes its stations—a celestial event occurring as we write this letter to you. We are thrilled that authors, artists, and photographers from around the world contributed their work to this issue. Our contributors hail from Australia, Brazil, Bulgaria, Canada, Germany, Italy, Mexico, and the United States. A truly global effort. On a technical note, please observe that the charts shown here depict degrees only. Since minutes are not shown, the degrees are not rounded up and you should be aware that if something reads 26º Aquarius, it indicates anyting between 26º 01’ to 26º 59’ Aquarius. Welcome to the second issue of our journal, we hope you enjoy it.